extremely lightfast and weatherproof pigmented ink. With its characteristic chisel nib, this pen enables even beginners to create beautiful calligraphy in no time at all! Line Width: 1-2.5mm depending on pressure. Available two brilliant metallic colours: gold and silver. 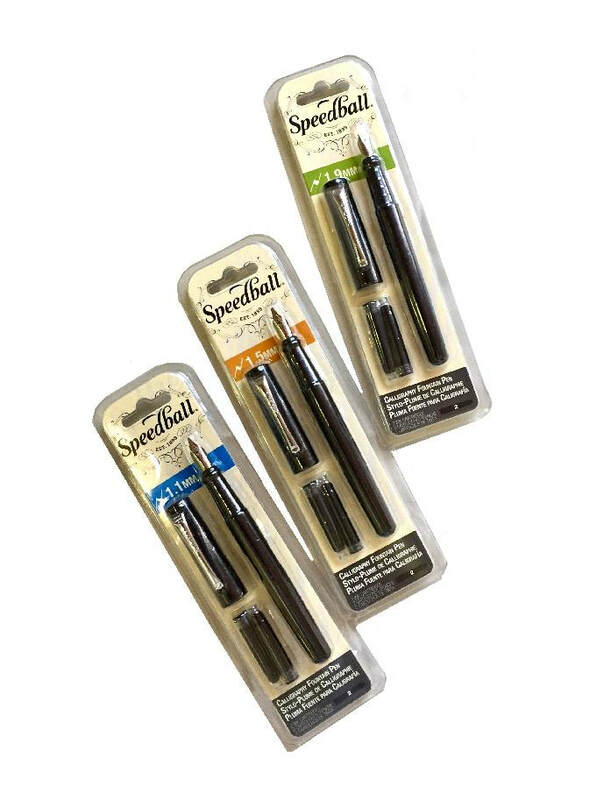 With a heritage rooted in fine pen-making that began in 1899, Speedball is synonymous with high quality lettering pens, nibs and inks. 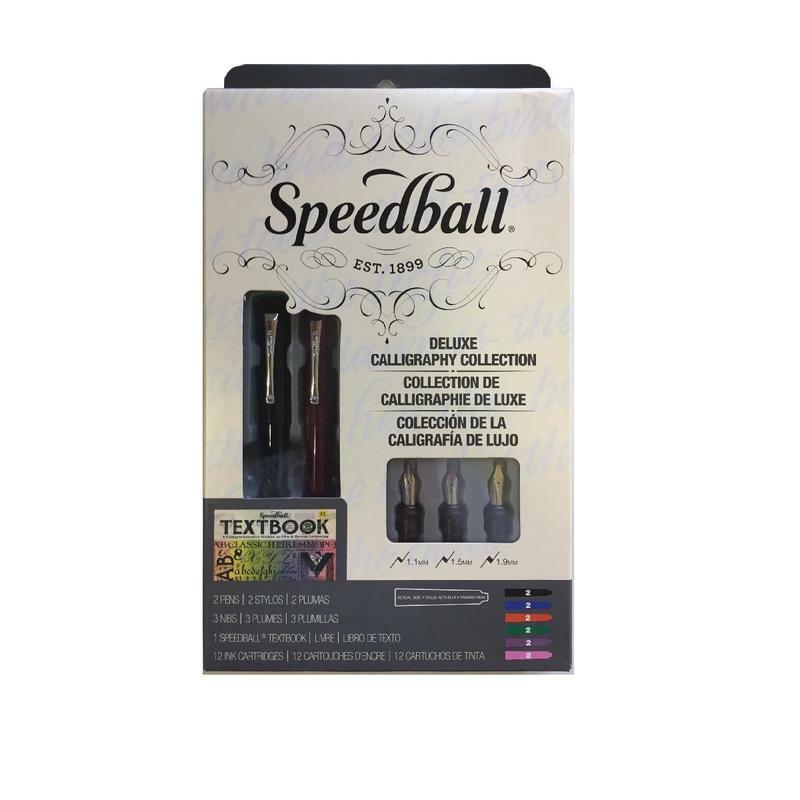 This kit allows drawing and lettering artists of all skill levels the full range of creative experiences offered by Speedball's impressive lines. comfort and value for artists, hobbyists and designers. Each pen features precisely machined nibs designed with a rounded tip, lightweight, ergonomic construction and a quality, free flowing ink. 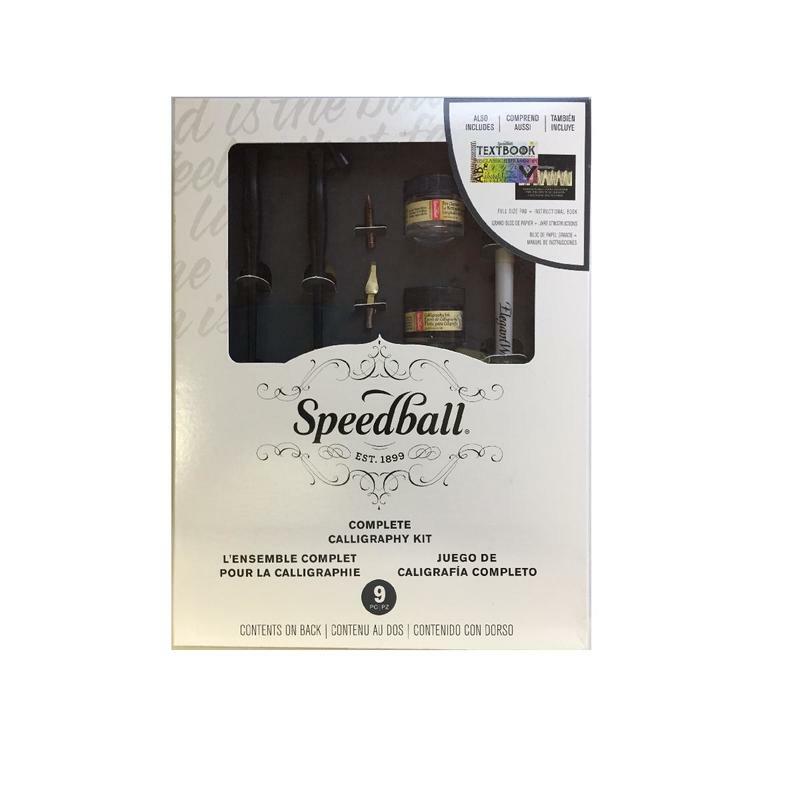 Speedball Calligraphy fountain pens provide a superior writing experience that allows the artist to create beautiful results easily. 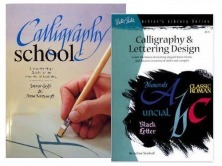 This comprehensive set is perfect for anyone eager to learn and master the art of fine lettering. 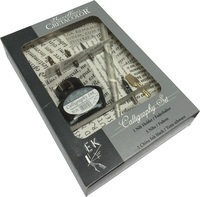 The kit contains 3 Viewpoint comfortable grip pens, 3 colour coded nib grades (1mm, 1.5mm and 2mm), 20 assorted Skript ink cartridges, a tracing pad and informative instruction booklet. 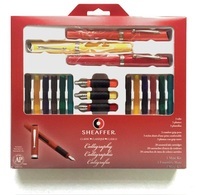 This compact set is ideal for exploring the craft of fine writing. The kit contains one Viewpoint Pen with 3 nibs (1mm, 1.5mm and 2mm), 4 assorted Skript ink cartridges, and an informative instruction booklet. ​These individual pens come with 2 ink cartridges (black & blue) and a single nib in sizes 1mm, 1.5mm and 2mm. Each set comes with a Parallel Pen, one black and one red ink cartridge, a converter to clean the pen and a nib cleaner. This calligraphy pen is also conveniently refillable. The cap colour indicates point size, not ink colour. See right for nib sizes. This handle offers perfect balance, classic design and excellent pen control. This slick wooden handle fits both calligraphy and pen nibs making it a versatile must have tool! Available in available in 1, 2, 2.5, 3, 3.5, 4, 4.5, 5, 5.5, 6mm. Resevoir's also available as additional. Manufactured by M. Myers & Son Limited of Birmingham England, this set consists of a pen holder and 10 oblique nibs sizes 1 to 5.5. The pen holder has a wooden handle with a steel nib holder at the end. It's ideal for things such as commercial art school use, ticket and showcard writing and oriental script writing.